While it was built on a foundation of basic plant science, research at the University of Nebraska–Lincoln’s Center for Plant Science is anything but basic. Faculty in the center are making discoveries in areas of metabolic biochemistry, stress biology, and genetics and epigenetics. While the science is groundbreaking, Edgar Cahoon, director of the center, believes the ability to bring findings to the field is what makes the work unique. "The Center for Plant Science Innovation has a strong foundation in basic research and we really value that, but we also realize that this basic research has to be translated into new products and new technologies to have real impact," Cahoon said. Research from the Center for Plant Science Innovation has led to improved stress tolerance, more nutritious crops, expanded bioenergy qualities and enhanced yields. Lili Hou, a postdoctoral research associate, and Tom Clemente, Eugene W. Price Distinguished Professor of Biotechnology, examine sprouts in a Beadle Center lab. The center grew from a late-1990s initiative proposed by then-University of Nebraska President L. Dennis Smith. His vision was to develop a signature program in plant science research that would combine faculty from departments on the University of Nebraska–Lincoln’s City and East campuses. The program launched in 1999 with a goal to enhance plant science research in support of Nebraska’ agricultural industry. Sally Mackenzie, Ralph and Alice Raikes Professor of Agronomy and Horticulture, provided leadership for the initiative and began laying the foundation to establish plant science innovation as a center. The University of Nebraska Board of Regents approved the Center for Plant Science Innovation in January 2008. Fast-forward 10 years and the center has evolved into a multifaceted plant biology center with 23 faculty spanning four different university departments. "The center provides us with the framework to promote collaboration among the different disciplines within plant sciences while training students and postdoctoral researchers who will be the next generation of academic and industrial scientists," said Cahoon, who has served as PSI director since 2010. The center features faculty from agronomy and horticulture, biochemistry, plant pathology and biological sciences. It also has active collaborations with other university centers and initiatives, inculding the Food for Health Center, Water for Food Global Institute, Industrial Agricultural Processing Center, Quantitative Life Sciences Initiative and the Consortium for Integrated Translational Biology. "Modern plant science research at the university has become even more robust through the collaborations fostered by the Center for Plant Science Innovation," said Archie Clutter, dean of the Agricultural Research Division. "Outcomes from the center's novel research continue to transform agriculture from the lab to the field." 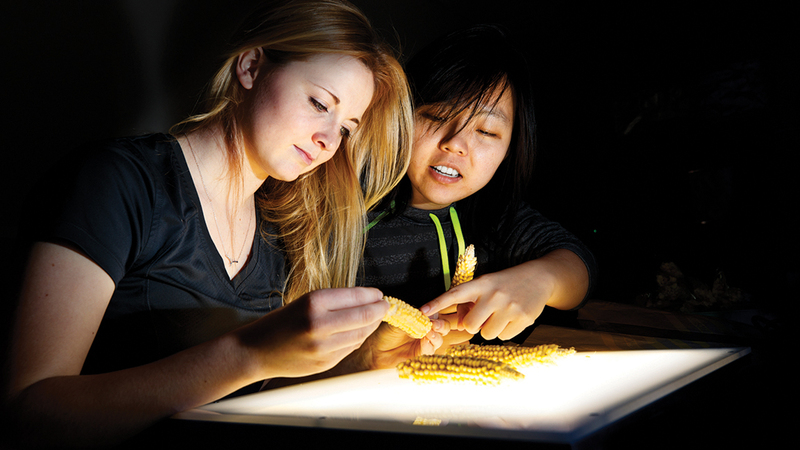 Nebraska's Leandra Marshall (left) and Ying Ren examine popcorn kernels on a light table. Research within the center is conducted at the Beadle Center on City Campus and greenhouses on East Campus and Nebraska Innovation Campus. The center also has access to designated field facilities for evaluation of research under divergent climactic conditions. In-house expertise in crop transformation coupled with these facilities has become the basis for an agricultural biotechnology pipeline that allows the center to maximize the impact of its research programs and bring knowledge to the field. Plant Science Innovation research is also supported by computational biology that guides gene discovery efforts and new gene editing techniques to expand the capacity of the pipeline for crop improvement. This work has the potential to impact the bottom-line of Nebraska producers, especially when commodity markets are low. In addition to developing stress tolerant, nutritious crops at higher yields, a number of research projects are focused on enhancing the quality of crops, which would enable producers to earn higher margins. Beyond Nebraska, plant science faculty have extensive international collaborations and conduct research that impacts the production and nutritional quality of staple crops in developing countries. From the development of salt-tolerant rice genes to combatting vitamin-A deficiency in sub-Saharan Africa, the center has placed a target on the challenge of global food security. Learn more about Nebraska’s Center for Plant Science Innovation online and in the Institute of Agriculture and Natural Resources’ Growing magazine.